Currently, China is probably the most interesting country on the planet. China is the world&apos;s third biggest country by territory, and has the largest population. It is one of the longest-running civilizations on earth with its unique and attractive culture. It has developed at record speed to become the second largest economy in the world. Furthermore, China holds innumerable attractions for tourists to explore. Below you will read about the top facts that you must know about this fascinating country. 1. China is One of "the Four Ancient Civilizations"
China is among the most ancient civilizations along with the Babylonian, Mayan and Egyptian. There has been official documentation of China&apos;s history for more than 3,000 years. 1978 Deng Xiaoping begins China’s opening up reforms leading to rapid economic growth. At 9.6 million square kilometers, China is the third largest country by area in the world. It has a north-south extent of 3,900 km and an east-west extent of 5,000 km. 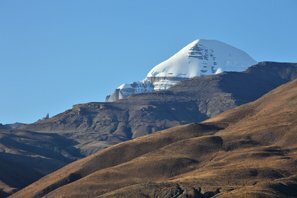 33% of the Chinese territory is mountainous, 26% high plateaus, 19% basins and deserts, 12% plains regions, and 10% hills. China also has the most international borders, neighbouring with 14 countries: Russia, Mongolia, Kazakhstan, Kyrgyzstan, Tajikistan, Afghanistan, Pakistan, India, Nepal, Bhutan, Myanmar, Thailand, Vietnam, North Korea. Generally speaking, the north is colder and drier than the south, and the west is drier than the east. Winter temperatures in Northeast China can reach -40 degrees centigrade, while summer in the south can be 40. Rainfall varies from a few millimeters per year in the Taklamakan Desert to over 3 meters a year in the southeast. See Best Time to Visit China for arranging your trip with regard to the weather. 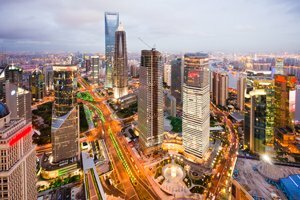 China has been the world’s fastest growing economy for the last 30 years (10% or more per year). It is now the world&apos;s second largest economy, its 2016 GDP being 11.4 trillion USD. 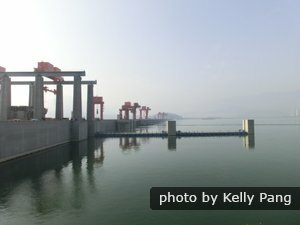 China is known as the factory of the world. It is the world&apos;s largest producer of concrete, steel, fertilizer, clothing and toys. China&apos;s pace of urbanization is fast: 300 million people have moved from rural areas to cities in the last 30 years (See China&apos;s Top Large Cities), and the same is predicted for the next 30 years (See Developing China). Transportation is also improving fast.Today, China has a new wave of intercity high-speed trains and city metros. Beijing Capital International Airport is the second busiest airport in the world and busiest in Asia. China has some large sea ports too, such as Shanghai (greatest cargo tonnage since 2005), Hong Kong and Shenzhen. Most minority groups have their own distinctive culture. Some also have their own language and writing system. Officially China has 56 ethnic groups. The largest group, the Han, occupies almost 91% of the whole population. 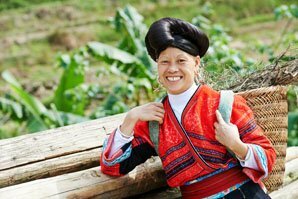 Among the 55 minority groups (少数民族), Zhuang, Manchu, Hui and Miao have the largest populations. 6. China has Rich Cultural and Philosophical Traditions. There&apos;s also beautiful Guilin, the splendid Yangtze River, the renowned Yellow Mountains, the lovely pandas and the beaches at Sanya. Food styles and ingredients vary by region; you can find everything of every flavor you like. The most famous dishes include: Peking duck, sweet and sour pork, kungpao chicken, mapo tofu, wonton soup, dumplings, spring rolls and chow mien. Make sure you try at least one of them. Among more than a billion people and in the country with the longest continuous history, there are entertaining, surprising, and particularly interesting things that they do or have done. Here are ten fun facts and recommendations about what is most fun in China. 8. Chinese use sticks to eat with. 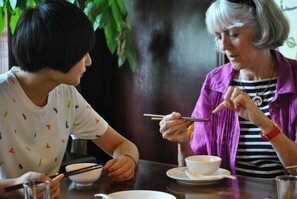 It is fun to try chopsticks in China. Invented during the Shang Empire times (1600–1046 BC), at first, chopsticks were generally kitchen utensils, but it became the common way to eat meals in the Ming Dynasty (1368–1644). One of the funnest things to do in China is trying all the different kinds of authentic Chinese food, and it is even more fun when you try to eat like the natives. 9. Millions of Chinese live in caves. About 35 million Chinese live in caves. It is a Chinese architectural style dating back to the stone age. 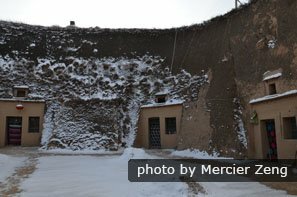 Chinese in many areas appreciate underground and cave dwellings since they are cheaper to build, easier to warm in the winter, and cool in the summer. In Shaanxi Province, cave dwellings are common, and if you want to stay in one, we can arrange it on your trip to China. 10. Kites were invented in China. Flying kites is fun for both kids and adults in China. 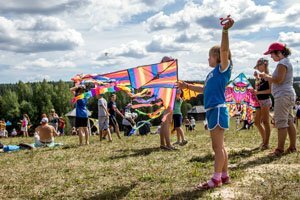 The Chinese have been flying kites for nearly three thousand years. It is said that two philosophers invented them in the 5th century BC. Silk fabric was sewn on bamboo frames. You too can enjoy flying kites with the Chinese kids and adults here. 11. Chinese invented the first kind of football (soccer). According to FIFA (Fédération Internationale de Football Association), football (soccer) — the most popular sport in the world — was invented in China over two thousand years ago during the Han Dynasty in the second and third centuries BC. The sport was refined during the Tang Dynasty (618–907) and Song Dynasty (960–1279). Professional players entertained the imperial court. It was called cuju (/tsoo-jyoo/ &apos;kick ball&apos;). Ironically over 2,000 years on, China, the largest population on earth with millions of soccer fans, has qualified for the FIFA World Cup only once in 2002, when they lost all three group games, conceded 9 goals and scored 0, finishing 31st, second last to Saudi Arabia. 12. Chinese people write by drawing pictures. Chinese characters are also known as hanzi (/han-dzuh/汉字 &apos;Han characters&apos;). It is a pictographic writing system and is the oldest continuously used writing system in the world. 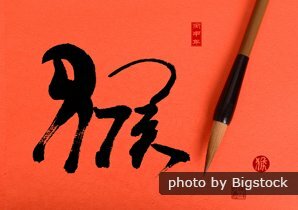 Its history is dated back to as far as the Shang Dynasty (1600–1046 BC) when they were inscribing ideographs on oracle bones. 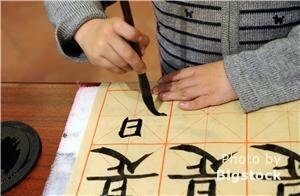 Chinese characters are used by more than a billion people. Over the centuries, the pictures became more and more stylized and less recognizable, though you can often guess the meaning. Trying to draw a character is fun. 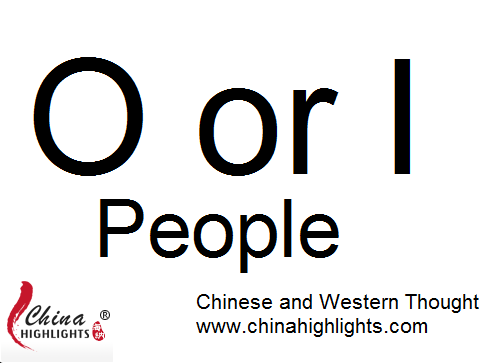 See more on 10 Facts You Should Know About the Chinese Language. 13. Chinese invented gunpowder... and fireworks. Fireworks are common on Chinese holidays. Fireworks are fun all over the world, and the Tang Dynasty was when Chinese alchemists invented gunpowder. It was soon used to make explosives, chemical and smoke weapons, and incendiary devices, and then later they made rockets and guns and cannons. 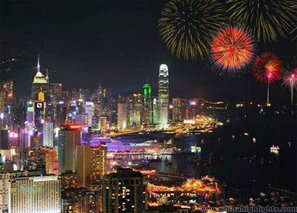 China produces by far the most fireworks and accounts for about 85% of the world&apos;s exports of fireworks. On major holidays, they are sold everywhere, and you can enjoy playing with them. 14. The First Emperor made a huge army of clay men! 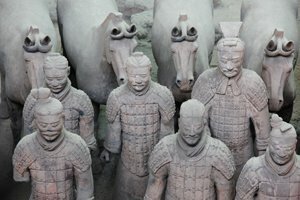 With China Highlights, you can get close to the Terracotta Army. &apos;First Emperor&apos; Qin Shihuang was a very powerful emperor and built a necropolis (a city of the dead) for himself to rule in the afterlife at a huge expense. Just a fraction of it has been uncovered — the Terracotta Army Museum. You can see thousands of life-size clay soldiers and officials and even animals he made for his fantasy kingdom there. 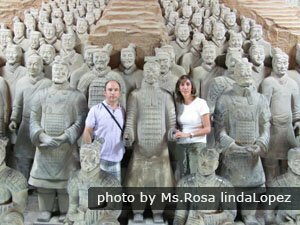 Daily VIP Xi’an Terracotta Warriors and City Discovery Tour: Uncover the amazing history. 15. People in Beijing eat scorpions on a stick. Fried scorpion and starfish are famous snacks in Beijing. 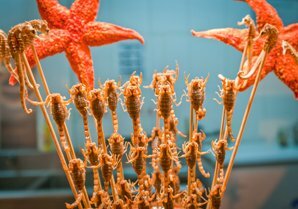 The scorpions sold on the streets in Beijing are grabbed live, dipped in boiling oil for a second or so and skewered on a stick. You can find a lot of other insects, mollusks, and tasty sea things for sale on Beijing&apos;s touristy pedestrian streets. 16. Chengdu is the funnest place to eat. 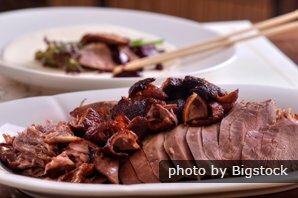 Sichuan cuisine usually turns out to be most foreign tourists&apos; favorite style of cuisine for its startling intense red-hot flavors and the Sichuan hotpots where you can stir in your own ingredients on a cooking pot on your table. It is fun way to spend time with family and friends. 17. Guilin is the funnest place in China. 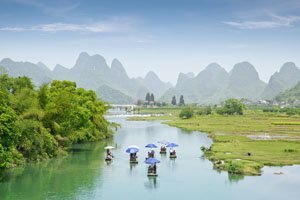 The Yulong River near Guilin is a beautiful place to raft and have fun. 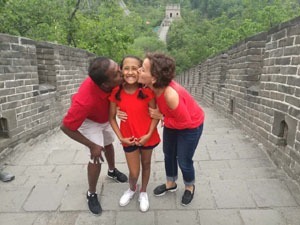 Guilin is the funnest place to visit because you can get out into the striking limestone countryside and enjoy recreational activities such as river rafting, cruises, seeing villagers and staying in villages, biking, and hiking. 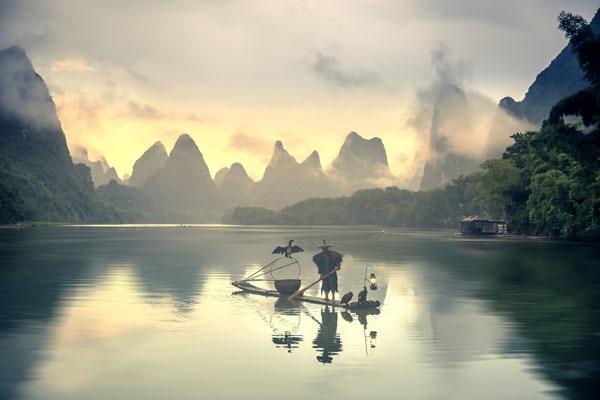 Yangshuo especially is a favorite town for young people and backpackers, with its exotic countryside resort feel. Quick transit from Shenzhen in 3 or 4 hours on a bullet train makes travel convenient from Hong Kong. 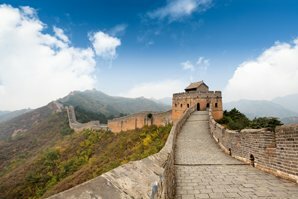 Plan with China Highlights to Make Your First Great Trip to China! 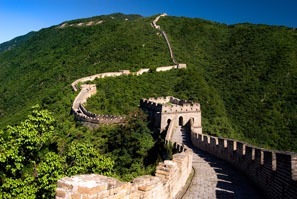 THE GOLDEN TRIANGLE: 8-Day Beijing, Xi&apos;an, and Shanghai Tour, three major tourist cities of China. For a unique and personalised experience of Chinese culture, you can also contact us for a customized tour.